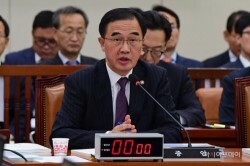 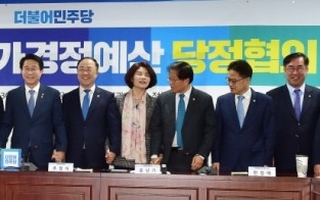 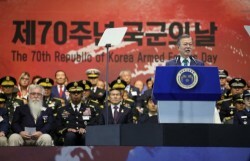 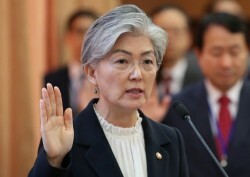 By AsiaToday reporter Lim Yoo-jinThe ruling Democratic Party and the government decided to submit an extra budget bill focused on supporting for the recent wildfires in Gangwon Province and boosting the national economy to the National Assembly on April 25 in order to get the bill passed in May. 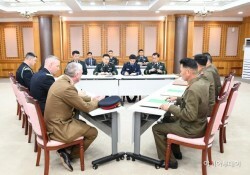 The ruling party and the government reached agreement on the ma..
By AsiaToday reporter Lee Seok-jong The two Koreas and the United Nations Command (UNC) held their first three-way talks on Tuesday to discuss demilit..
Koreas agree to hold ceremony to link rail and roads late Nov. or early Dec.
By AsiaToday reporter Heo Go-woon & Joint Press CorpsSouth and North Korea on Monday held high-level talks that saw a host of agreements, including a p..
By AsiaToday reporter Heo Go-woonSouth and North Korea will hold high-level talks on Monday at the southern side of the truce village of Panmunjom to discu..
By AsiaToday reporter Heo Go-woonThe South Korean government is not considering the possibility of lifting its sanctions imposed on North Korea following t..
By AsiaToday reporter Heo Go-woonForeign Minister Kang Kyung-hwa said Wednesday that her ministry was "reviewing with relevant ministries" the lifting of t..
By AsiaToday reporters Joo Sung-sik & Heo Go-woonPresident Moon Jae-in will embark on a 9-day trip to Europe this Saturday, including stops in France,..
By AsiaToday reporters Heo Go-woon and Park Ji-sook & Washington correspondent Ha Man-jooU.S. 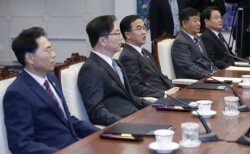 Secretary of State Mike Pompeo met with North Korean lead..
By AsiaToday reporter Lee Seok-jong It has been revealed on Thursday that Japan expressed displeasure over the visit of the South Korean navy's amphib..
By AsiaToday Washington correspondent Ha Man-joo & reporter Heo Go-woon U.S. Secretary of State Mike Pompeo will visit North Korea on October 7 to..
By AsiaToday reporter Park Ji-sook On this 70th anniversary of Korea's Armed Forces Day, President Moon Jae-in engaged in several activities focused o..